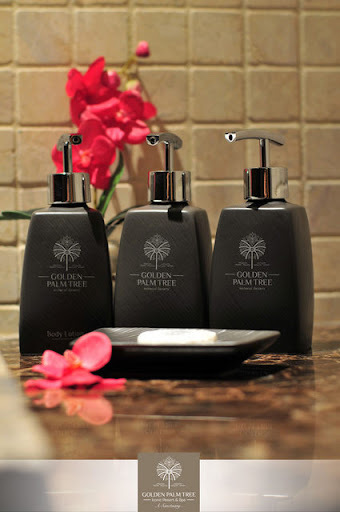 Golden Palm Tree is a 5 star haven of peace and it stretches out from the Sepang coastline, almost a kilometer into the sheltered waters of the Straits of Malacca with 392 luxuriously appointed sea villas that shape a palm tree. We were served cooling Lemongrass welcome drinks once we arrived. Amelia assigned us room keys and I have two roommates this time. Yay!! I was so happy that we are staying in Canary Palm Villa! After checked-in our room we went to Sepoi Sepoi for dinner. Thanks Buggy service for sending us along the way. Every Golden Palm Tree building's rooftop is made of alang-alang thatch. You can smell it especially when you step inside your room. 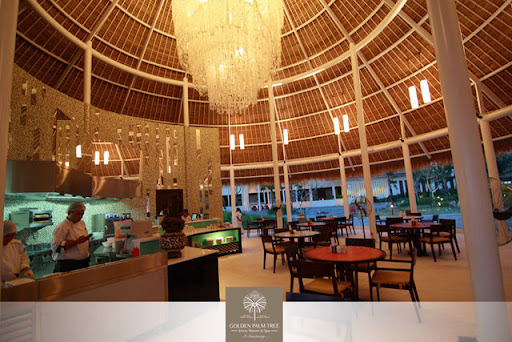 "Reminiscent of a large cabana with alang-alang thatch roofing, this beachfront cafe outlet stands elegantly at the arrival plaza to Golden Palm Tree. Its minimalistic and chic look is accentuated by a four-tiered shell chandelier hanging low at the centre of the premise, chiming to the gentle nudges of the sea breeze." White waiting for food we were given XPAX The Cube for our broadband access to social network. Have you know what is The Cube? It was freshly cook on fire!! Hijrah has been waiting so long for his Mee Mamak. However, after all the waiting worth it. 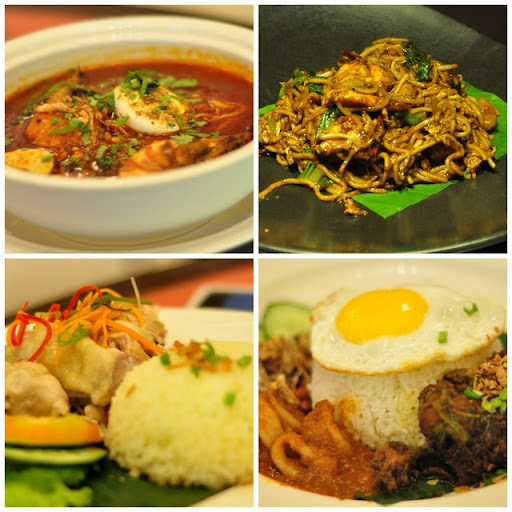 I highly recommend you guys to order food that freshly prepared at Sepoi Sepoi to ensure you have the best dining experience. 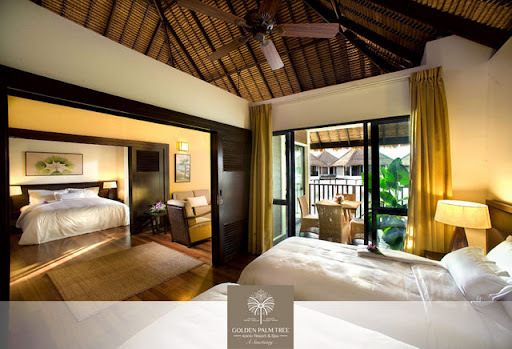 After dinner we then go back to our spacious room @ Canary Palm Villa. The sky is dark so I didn't take much photos of the villa. However thanks to Golden Palm Tree here's some panoramic photos of the interior. 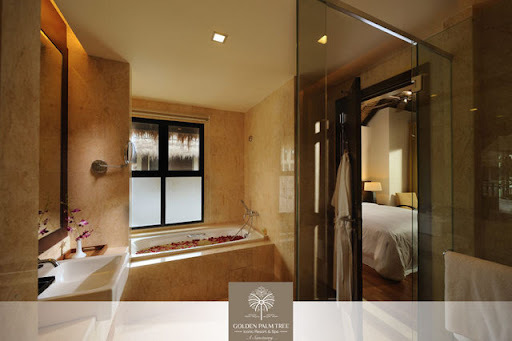 Measuring 82sqm, the spacious Canary Palm Villa is raised on stilts and features two fixture marble bathrooms, a lounge with a queen sized bed, a twin bed and a roomy living area. Wanna have flower bath in the marble bathtub?? 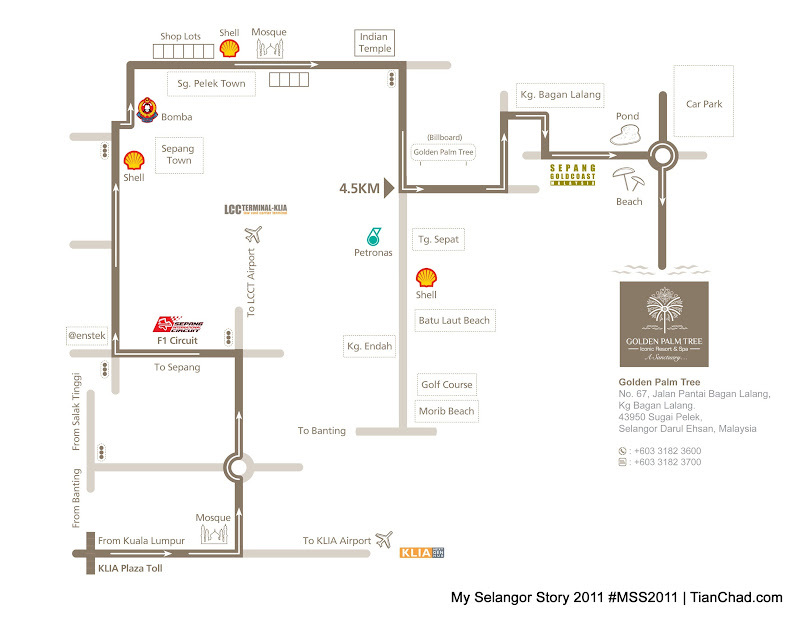 First day was our relaxing day @ Golden Palm Tree Resort & Spa. So I utilized my time mostly on the sofa with TV switched on listening to soothing music and then sleeping on the comfortable bed. We all sleep early because there are free non-motorized sports awaiting us @ Smiley Beach tomorrow morning!